Nokia's first Android device disappoints with its sluggish performance. Compact design; Study contruction; Good music quality. Sluggish performance; Lacks many popular Andoid apps; Doesn't support 720p videos; Lacks front-facing camera. Nokia's focus remains on Windows Phone platform. Now that this Finnish company is owned by Microsoft, there's no doubt about that. The high-end Nokia devices will be powered by the Windows Phone platform. However, the Redmond-based company is probably planning to replace is dated Asha line-up with these low-cost Android phones. The combination of Nokia and Android sounds very interesting, but does this handset live up to the hype? Despite being the first phone from the Finns to feature Google's OS, the Nokia X's retail box doesn't feature the word Android on it. Apart from the phone, the package contains a wall charger, a bunch of documents, and pink headset (exactly the one you get with the Lumia 520). What's missing here is a USB cable. The Nokia X looks like a relatively big Asha 501. By today's standards, the X is a compact phone. Something that you can operate with a single hand. Thanks to the matte finish, you don't have to worry about the fingerprints. The phone comes in variety of hues including red, cyan, yellow, black, and white. However, nothing beats the charm of the bright green. It's also the colour to own to show your affection towards Android. Similar to the Lumia 630, the phone features interchangeable shells. If you get bored of your phone's colour, you can simply buy a new panel. Like most low-end smartphones, the Nokia X has a user-replaceable battery. The phone features two micro SIM slots and one really loud mono speaker. The Lock button and Volume Rocker are on the right side of the device. For menu navigation, the phone only has a single button. We will come to this point later in the review. The phone is rock-solid. That's something you rarely see in this price bracket. Just like the Asha 501, this phone can easily survive a few drops. Build precision is another area where this phone shines. Everything from buttons to the 3.5 mm jack speak for the build quality of this phone. The Nokia X sports a 4" IPS screen. The sharpness (233 ppi) is quite decent at this price tag, but nowhere near the Moto E's pixel-packed screen. Its colour reproduction is good too. The brightness and viewing angles are also good for a budget phone. The panel supports only two-point touch, which can be disappointing for fruit Ninja addicts, as this game requires you to use multiple fingers to slice as many fruits as possible. Overall, in the display department, you get what you pay for. Being the entry-level member of Nokia's Android family, the X is powered by a dual-core Snapdragon S4 chipset clocked at 1 GHz. Similar to the Lumia 520, this handset comes with 512 MB RAM. Other features include a 3 megapixel fixed-focus camera, Wi-Fi, Bluetooth, 4 GB internal storage, microSD card slot, and 1500 mAh battery. The phone runs Nokia X software platform 1.0, which is based on AOSP (Android Open Source Project). To be precise, Nokia has used Android 4.1 Jelly Bean. The user interface looks nothing like Android though. In fact, it looks like a poor man's Windows Phone. Instead of the grid of icons, you get tiles. Sadly, unlike Windows 'live' tiles none of these tiles are dynamic. You can also add standard Android widget to the homescreen. Aesthetically, that's a horrible decision. The widgets completely break the software's tile-based design language. Operating the phone is another problem altogether. As mentioned earlier, the phone only has one capacitive key 'Back'. To make up for this, Nokia has assigned a long press function to the button, which takes you to the homescreen. Now considering the number of times any smartphone user would want to visit the homescreen, it deserve a dedicated button. Swiping sideways gives you access to notifications panel, which Nokia like to call Fastlane. Here you can see the list of recent apps or even the ones that are running in the background. You can close them from here. Again, I feel that Nokia should have provided a proper way to manage multitasking. To make the matters worse, the phone runs like a cow on the ice. Moving or resizing tiles is so sluggish that it feels as if you're running a Windows Phone on 15 fps (frames per second). The Lumia 520, which runs smooth, is powered by similar hardware. However, it's the software optimisation that makes all the difference. Windows Phone 8 is designed to run on 512 MB RAM. On the other hand, Android requires at least 1 GB RAM to work properly. Makes me wonder why Nokia didn't put 1 GB RAM in its first Android device. The device lacks popular Google services such as Maps, Drive, Hangouts, Play Store. Out of the lot, you'll miss Play Store the most as Nokia's app repository lacks many popular apps including WhatsApp. 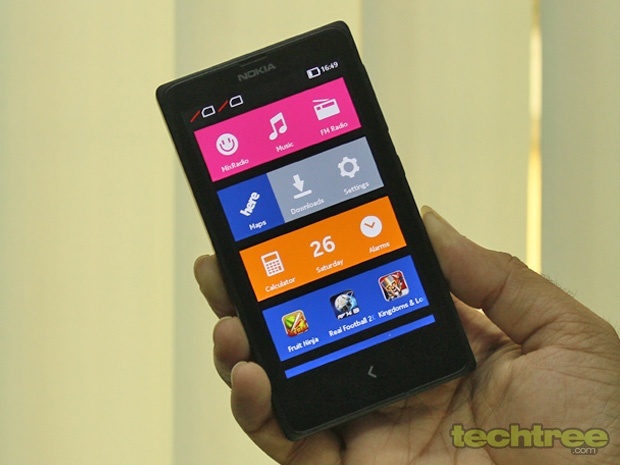 However, there's a workaround to get most of the Android apps on the Nokia X. The Nokia X's sound quality is quite good. Plus, there are enough sound settings to play around with. Being a Nokia device, it comes with MixRadio, which offers free music downloads for first three months. Everything is pretty much sorted in the music department. When it comes to video playback, the phone falls flat on its face. First of all, the handset doesn't support most file formats out-of-the-box. With MXPlayer you get the codec support, but the playback remains so jerky that it almost feels like watching a slide-show. The Nokia X packs in a 3 megapixel fixed-focus camera. It lacks an LED flash. The snapper offers a few manual controls such as sharpness, contrast, saturation, brightness, and white balance. The resulting images are disappointing though. The only saving grace here is that the camera produces accurate colours. Coming to the subject of video recording, 480p is the max this phone can pull off. The quality of these videos is nothing to write home about. 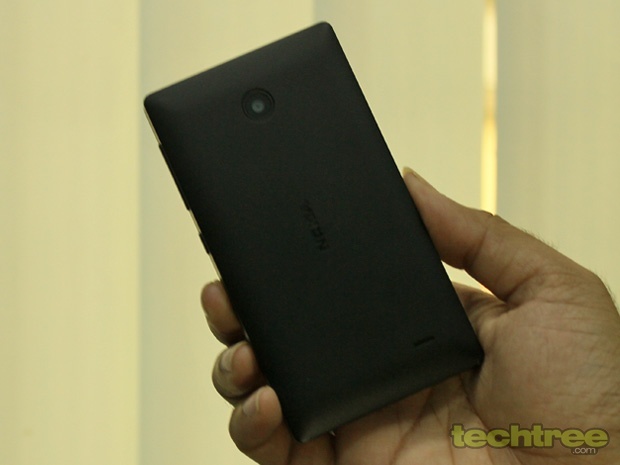 In this price range, Nokia's own Lumia 520 does a much better job. The Nokia X's dialler looks quite similar to that of the iPhone. Being a dual-SIM device, it comes with elaborate SIM settings. The phone's network reception is strong. GPS and Wi-Fi also worked without any issue. Moving onto messaging, Nokia's keyboard is quite sluggish. Although it's well designed, it feels too small for comfortable typing. On a full charge, the 1500 mAh battery easily last for a day and half with normal day to day use. Since the phone struggles with 720 videos, we played 480p video in our loop test, in which the phone lasted for six hours. The combination of Nokia and Android sounds very promising on paper. However, with focus set on Windows Phone, the Nokia X is an half-hearted attempt at Android from the Finns. No doubt, the phone's design and construction are top-notch, but its sluggish performance is a deal-breaker. Due to the single button layout, navigation is also painful. If you're looking for a budget Android device, the Moto E is the right choice. Those who want to stick with Nokia, should go for the Lumia 525.